GolfBUD features fairway location for distance to the green estimates. GolfBUD is your private golf game log. Create your own master scorecard to match the way you play. Play from any tee during your round. Upload your scorecard to your facebook or other social media account. Send your scorecard or personal game stats via instant message or email. GolfBUD is your personal game tracker. Monitor your game on every hole from your tee shot to final putt. Map your fairway location on Apple Watch and supported iPhone sizes. Touch a tee number on your scorecard to enter the tee log and view your "Tee Shot" and "On The Green" statistics. Record how you are playing from the tee and your short game using the individual tee logs. 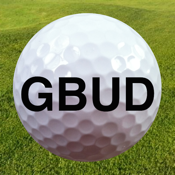 Touch the GBUD button on the home screen and duplicate a scorecard for a new round of golf. Touch the "i" button and enter your tee time, edit the course name, map the course location, and add personal notes. The Watch companion, GolfBUD Caddie, can log complete rounds of golf without being paired to it's iPhone. The force touch "Map me..." requires a paired iPhone with cellular connection for fairway mapping. The tee log is truncated to capture the tee shot distance and two short game components along with total putts and score. Force touch on the tee log to view your round scorecard. Par or better achievements are color coded. The "Tete-A-Tete" is the secret communication between Watch and it's paired iPhone. Load your courses from iPhone to Watch and Watch back to iPhone. Keeping your Watch courses current you can view previous round scores in time-travel and view what day of the month you have a tee time scheduled in the future. The glance maintains in play round stats and displays stats for the last three rounds when not in play. Download your game information through iTunes and import into your favorite spreadsheet application. Your scorecard image, as well, is accessed through iTunes and old images should be deleted from your iPhone. GolfBUD is a personal tool. There are NO advertisements, in-app purchases, data mining, tracking, or other invasive surprises. You have total control over all GolfBUD information. For further privacy information see the support website. At this time GolfBUD does not provide geolocation tracking to pinpoint your location on the fairway to the hole.